Photographer Alexx Mayes captured this view of the Falcon Heavy's third burn near Reno, Nevada on Feb. 6, 2018. Six hours after SpaceX launched its new Falcon Heavy rocket on its first test flight yesterday (Feb. 6), unsuspecting skywatchers in the western U.S. caught a glimpse of the rocket's second stage firing up one last time as it blasted out of Earth's orbit and off into the solar system. Shortly after the second stage initiated this burn, people in the western U.S. began reporting rocket sightings in the evening sky. While SpaceX has not officially confirmed that the images or videos on social media were of the Falcon Heavy, it was the only rocket scheduled to be flying over the Earth at that time and place, so it seems highly unlikely these spectators saw anything else. While many of the witnesses reported seeing the rocket by chance when they just happened to look up, at least one telescope — the MMT Observatory (MMTO) in Mount Hopkins, Arizona — spotted the Falcon Heavy during routine night-sky observations. "The big, fast-moving blob is the exhaust from the Falcon Heavy's burn," Timothy Pickering, a staff scientist at MMTO, said in a tweet. "There's also a plane heading north at the beginning and a small satellite at the end." 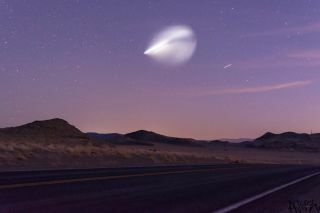 Another Twitter user, Brittany Brelle, shared a photo of the rocket taken from Southern California, tweeting, "Moral of the story: Always look up and follow the moving thing in the sky." Editor's note: If you have an amazing photo of the Falcon Heavy that you'd like to share for a possible story or image gallery, please contact managing editor Tariq Malik at spacephotos@space.com.